Susan Burek was well on her way to a wonderful life in the country. She had built her Victorian house — with her own two hands, plus some help from her father — a few miles west of Detroit, and on these six acres she was ready to get serious about having an herb farm. “That’s why I moved,” she says. Guinea fanatic. What indeed is a keet? Susan learned quickly when she soon took home seven of the baby birds — they are not called chicks — and set out to get acquainted with them. The keets grew to become guinea fowl, and like with so many pursuits of the country, Susan became hooked. Like many others before her, she’s now a guinea fanatic. On her beautiful spread in the Michigan woods and fields, Susan has many birds — chickens, peacocks, ducks — more than a hundred in all. But it’s the guineas she’s most fascinated by simply because they are quirky, fascinating creatures. The birds wander constantly across Susan’s lot, stepping quickly, always anxious and more than a bitnervous, jerking their heads this way and that, always quick to keep a safe distance from humans. Their murmuring cackle isn’t the least bit soothing, and when a stranger gets too close, the cackle becomes loud and downright irritating. But for someone living in the country, that can also be a comfort. Because of the guineas, Susan always knows when someone pulls onto her property. 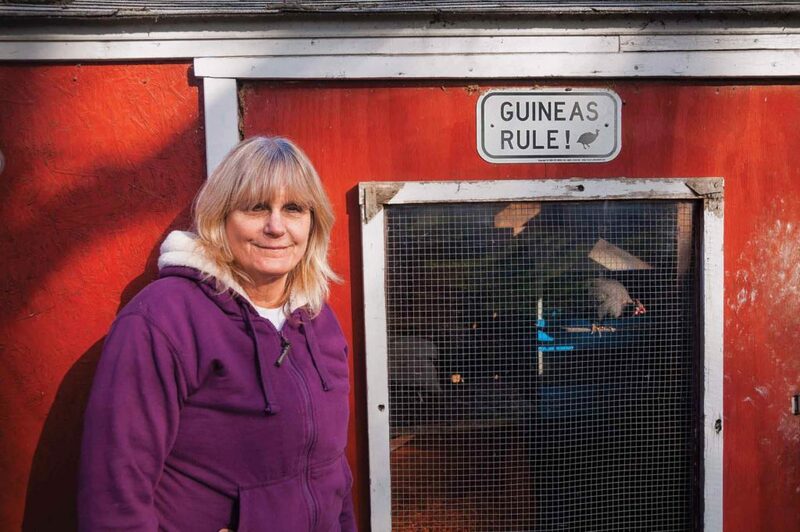 Susan Burek has many items around her farm to show her allegiance to the guinea, a quirky, odd looking bird. Taste for bugs. If you want a best friend, get a dog. But if you want something that eats the bugs and pests bothering you around the homestead, the guinea wins hands down. Guinea fowl are always foraging for bugs, always on the move, giving the ground a peck or two with each quick step. Ticks, slugs, flies, and crickets — all are on the main course for a guinea. The birds travel in cliques, huddling and running together when frightened. And when a group comes across a snake, they’ll gang up, easily take it on, and have a feast. For dessert, they’ll chow down on weed seeds. people,” as Ferguson puts it. But she learned the secret to making the birds calmer, something she passed along in her book. The trick, she says, is to let the keets implant with their human caretaker. Burek gives Ferguson a lot of credit just for that single tip. It’s what easily lets her get her fowl inside their poultry house for the night. Otherwise, guinea can often roam and roost at night in the trees. Burek wants her birds close so she can watch them eat her herbs. Remember, she’s an herbalist, too, and she believes guineas aren’t as dumb as many think. She believes the guineas self-medicate with her herbs. With those herbs, Burek has developed herbal products — tonics, tinctures, and sprays — that she sells to other poultry owners. Cow pats can reveal a lot about your animals’ health.